The Minister of Home Affairs Sri Rajnath Singh visited the Akshaya Patra Foundation's kitchen facility in Lucknow to grace the function celebrating one complete year of operation in Lucknow. Sri Ashutosh Tandon, (MLA, Lucknow East) and Mr Sharda Pratap Shukla, (MLA, Sarojini Nagar) also accompanied him. Shri Rajnath Singh witnessed operations of the centralised kitchen facility serving food to 74,000 school children in 758 Government schools in Lucknow. Addressing the occasion, he said, "Feeding empty stomach is big service to God. Akshaya Patra is doing this service which, for me, is the biggest service to humanity. Not everyone gets this opportunity and when one organisation is doing this service, we would help it so that it can feed more empty stomachs. He further added that for good education, nutritious meals are an imperative for school children. 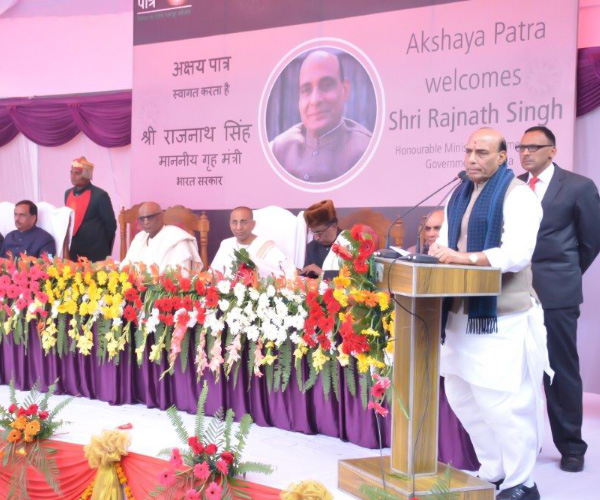 "The mid-day meal scheme is a step forward in this direction and organisations like Akshaya Patra are playing an important role in achieving Government's resolve of Sarva Siksha Abhiyan", said Shri Rajnath Singh.